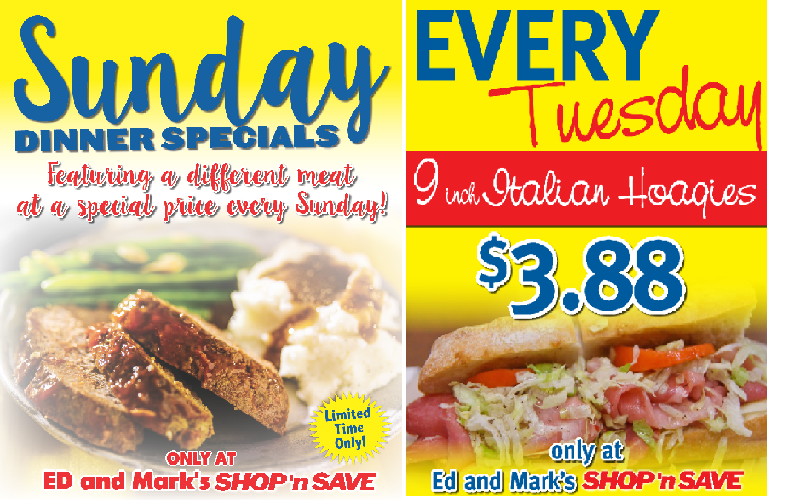 Ed and Mark's Shop 'n Save pledges to provide you with quality goods and services, giving you the most value for your money. We will work hard to earn your continued loyalty. Enjoy the freshest fruits and vegetables. We stock the best seasonal items including crisp apples and yummy vegetables. Our deli has fresh and tasty deli meats, cheeses and other great selections. We have the freshest cold cuts and the highest quality. Don't have time to make dinner or get food prepared for everyone to come over and watch the big game? We make great hot foods that are ready for you. Download coupons on the things you like on your Perks card. No more clipping. Just buy grocery items, swipe and save. Just login to your Perks Online account and start saving with eCoupons. Earn 10 to 20 cents off* per gallon of gas at participating SHOP 'n SAVE stores. The more you spend, the more you save at participating gas stations. Get e-mails on exclusive SHOP 'n SAVE savings, advanced notifications pertaining to discounts on gas, shopper events and a whole lot of other ways t o save big. Sign up for the newsletter to get these great deals. Take advantage of every day savings and deals with your SHOP 'n SAVE Perks Card. New this week items are updated on a regular basis so keep checking back frequently for the most recent weekly circular specials.